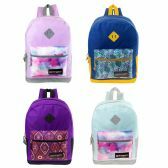 24 Units of Trailmaker Classic 17 Inch Backpack - In 4 Colors Girl Colors - Backpacks 17"
24 Units of Trailmaker Classic 17 Inch Backpack - In 4 Colors Girl Colors - Backpacks 17" at low wholesale prices. 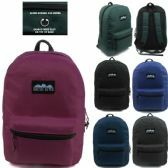 alltimetrading.com offers Backpacks 17" at bulk discounted prices. 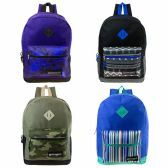 Our Trailmaker 17 Inch Classic Backpack is prefect for all your charity, school and non-profit events. 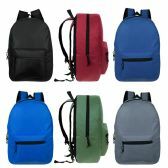 This item is made with our strong and durable 600 Denier polyester. 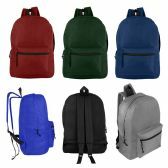 Our classic style backpack measures 17 inch tall, which is great for all grade levels. 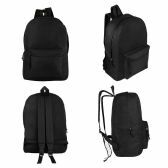 Includes a large front pocket, which allows for more storage for your essentials. 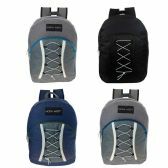 Also, this bag has reinforced stitching on each strap to make it more durable. This edition of our 17 Inch Trailmaker Classic comes in our signature girls coloring. 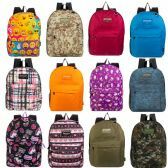 24 Units of ARCTIC STAR 17 INCH BACKPACK ASSORTED COLORS - Backpacks 17"
24 Units of 17" Kids Classic Padded Backpacks in 4 Assorted Unique Prints - Backpacks 17"
24 Units of 17" Backpack in 4 assorted print - Backpacks 17"
24 Units of 17" Kids Basic Black Backpacks - Backpacks 17"
24 Units of Bungee Cord Lace Up Backpack in 5 Assorted Colors - Backpacks 17"
24 Units of 17" Wholesale Kids Basic Black Backpack in 6 Assorted Colors - Backpacks 17"
24 Units of 17" Wholesale Kids Basic Backpack in 6 Assorted Colors - Backpacks 17"